THERE are so many things wrong with the PDP. It is an understatement to insist it is a very imperfect political party. But for everything that is wrong with the PDP, the APC is worse. It is ludicrous to pretend the APC is squeaky-clean while the PDP is corrupt when a large chunk of APC members were formerly in the PDP. Today, both the Senate president and the Speaker, for example, are former PDP members. These turncoats did not become new creations when they crossed over to the APC. When queried as to why APC’s so-called anti-corruption campaign is mostly directed at PDP opposition members, the APC party chairman John Odigie-Oyegun insists the PDP has been the party in power for the last 16 years. This is disingenuous because the APC and its legacy parties have also been in power for the last 16 years. 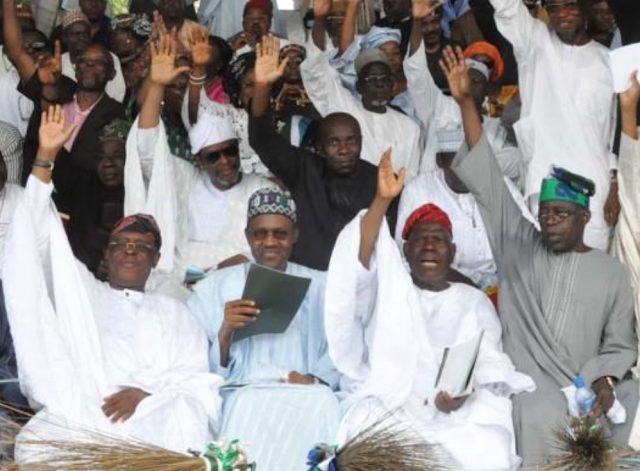 To win the last presidential election, APC had to match the political rigmaroles of the PDP. Indeed, APC prevailed because it was ultimately more unscrupulous. APC successfully exaggerated the vote in its areas of strength in the North-West far more than the PDP did in the South-South and the South-East. In the process, twice the number of people were alleged to have voted in old Kano (Kano and Jigawa) than did in Lagos. So meticulous were Kano voters, they did not void a single ballot out of over 2 million votes cast. If you believe that, you can believe anything. In the final analysis, APC won the election because of the humanity and political maturity of one man: Goodluck Jonathan. Presidents don’t lose elections in Nigeria. The Nigerian president possesses the power and resources to manipulate any and every election to his advantage. Make no mistake about it, Goodluck Jonathan wanted to win the last election. However, he did not want to win at all costs. He lost the election because, from the get-go, he was prepared to lose for the sake of advancing the democratic process in Nigeria. The evidence is there for all to see. Out of five elections conducted between 2011 and 2015, the PDP lost four, in spite of being the party in power at the centre. It lost in Ondo. It lost in Edo. It lost in Anambra. It lost in Osun. It only won in Ekiti. In effect, the presidential election was paradoxically the icing on the cake. The PDP not only lost that election, Jonathan accepted defeat even before the final results were tallied, in spite of all the rigmarole that attended it. He did not ask for dogs and baboons to be soaked in blood. It should be clear to Nigerians today that we are now in the grip of a very different captivity in the APC. During the campaign for the last elections, APC members were lavish with threats of fire and brimstone should their party lose. They told Nigerians in no uncertain terms that if they lost, they would not accept defeat but would even form their own kangaroo government. Now that the APC has captured power at the centre, they are hell-bent on prosecuting the principle of winner-takes-all. Today, the APC not only controls the presidency, it prevails in 22 of the 36 states in Nigeria. The PDP, on the other hand, controls only 13 states; with the remaining solitary state held by APGA. However, the APC is not satisfied with this supremacy. It is determined to contest the verdict of the election virtually everywhere it lost. While it claims the 2015 election was free and fair where it won, it insists the election was crooked where it lost. In short, the APC is determined to have its cake and eat it too. This agenda has been executed with single-minded APC rascality. APC challenged the outcome of elections in the oil-rich Southern states. It then embarked on an onslaught of intimidatory attacks on the judiciary to make it fall in line with its agenda. To ensure it prevailed, some tribunal chairmen were summarily dismissed, replaced with more maleable choices. Some cases were even transferred to APC’s presidential stronghold in Abuja on spurious grounds. So doing, APC secured the verdicts it wanted. The tribunals cancelled the elections in Rivers, Abia and Akwa Ibom, requiring them to be rerun. However, APC met a firewall in the Supreme Court. The apex court refused to be intimidated, in spite of President Buhari’s loaded statement in far-away Ethiopia that the Nigerian judiciary is his major “headache” in the fight against corruption. It overturned the doctored verdicts of the appeal courts in Rivers, Abia and Akwa Ibom, restoring the mandate of their PDP governors. So doing, the “Supremes” immediately became public enemy number one of the APC. There was nothing wrong with the judiciary when it ruled in favour of the APC in Yobe, Ogun, Lagos and Benue. But when it ruled against the APC in Rivers, Abia and Akwa Ibom, something became fundamentally wrong with it. The truth is that the issue of the legality of the usage of the card reader as opposed to the manual register had been established in the case of Agbaje versus Ambode in Lagos. To that extent, the tribunals in the South-South erred in law by not using the same principle in subsequent cases. Instead they agreed to kowtow to APC pressure. For a party that insists it is anti-corruption and claims to be prosecuting the PDP for using public funds to fight elections, Oyegun revealed APC interest in the South-South states is because they are resource-rich. This is the same language we heard from APC legislators when they were fighting themselves silly over “juicy” chairmanship positions in the National Assembly. If APC were not a past-master at using public funds to finance elections, why would it be so determined to control the resource-rich South-South oil-states by hook or crook? The APC is not only determined to winner-take-all today. It is equally determined to winner-take-all the 2019 election at all costs. Jonathan is from the South-South; a minority region. Nevertheless, he chose a Northerner, Attahiru Jega, to be INEC chairman. Many will tell you that was a major blunder that cost him re-election. Compare that scenario to what we have now. Buhari is from the North-West; a majority region. Nevertheless, he has chosen another Northerner to be INEC chairman. When Jonathan chose Jega, he chose him to great national approbation. But when Buhari chose Amina Zakari as Acting INEC chairman, he chose her to widespread public uproar. The Nigerian Constitution does not make any provision for the appointment of an Acting Chairman of INEC. Buhari is from the North-west: Zakari is from the North-west; violating the convention that the president and the INEC chairman should come from different geopolitical zones. Moreover, Alhaji Tanko Yakassai revealed that Zakari’s late father, the former Emir of Kazaure, was married to Buhari’s elder sister. Yakassai further disclosed that Buhari spent a significant part of his formative years in the home of Zakari’s father. This makes Zakari’s choice as INEC Acting Chairman totally inappropriate. Certainly, her appointment could not have arisen out of the president’s commitment to INEC impartiality. This inclination continued with the appointment of substantive INEC chairman. Again, President Buhari chose Mahmud Yakubu, another Northerner from Bauchi in the North-east. In the few months Yakubu has been INEC chairman, the organisation has become infamous for conducting inconclusive elections at the promptings of the APC. APC’s strong-arm political tactics are deleterious to Nigerian democracy. Its contempt for the rule of law and its blatant violation of judicial verdicts are anti-democratic. Its witch-hunt of the PDP ensures it will not agree to lose in 2019, for fear of being paid back in its own coin. It also ensures that another Jonathan will think twice before agreeing to accept defeat in the future, learning from the fate of the PDP at the hands of the APC. The evidence suggest the APC is far more interested in securing its political future than in promoting the growth and development of democracy in Nigeria. In view of the milestone achieved in 2015 as a result of Jonathan’s gentlemanly departure, APC represents the worst thing that has happened to Nigerian democracy in recent times.